For best results using, thoroughly clean surface first using BlACKFIRE Interior Cleaner. 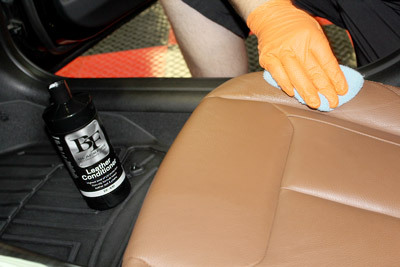 Apply a dime-size amount of BLACKFIRE Leather Conditioner onto a foam or microfiber applicator and thoroughly massage into the leather. Allow lotion to penetrate for several seconds. Then lightly buff with a microfiber towel to remove any excess. Related Items - BLACKFIRE Leather Conditioner 128 oz.